The Nisca PR-C201 retransfer ID card printer (item#: PR-C201) is a dual-sided solution designed to deliver stunning ID cards and badges. Retransfer technology allows you to print on the entire surface of the cards, or on uneven surfaces such as smart cards or ABS, PET, PVH and Polycarbonate cards. The print quality of the Nisca PR-C201 ID card printer is astonishing: 600 dpi, 24-bit images for flawless colors. Not only do you get perfect badges but you get them at the amazing speed of 145 color cards per hour! For an even faster throughput, the printer is equipped with 250-card input and output hoppers. 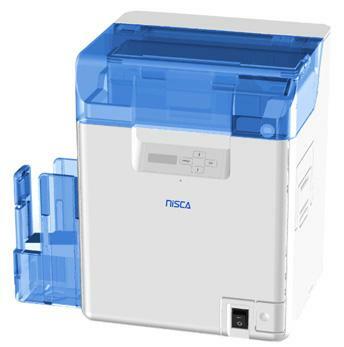 The Nisca PR-C201 Retransfer Dual Sided ID Card Printer features a 5-year warranty on printer and printhead.